Spring is here, so white not ensure your teeth are as white as your new warm-weather wardrobe? 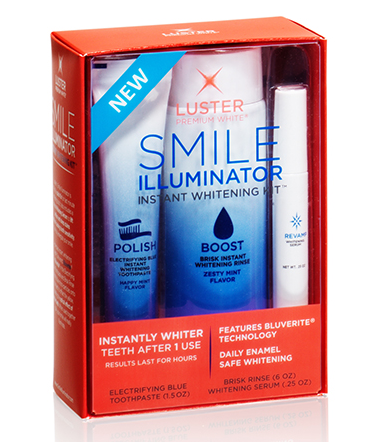 Now they can be with Luster Premium White’s new Smile Illuminator Instant Whitening Kit. We recently discovered - and tried the easy-to-use system that polishes, boosts, and revamps teeth to re-energize smiles with zero tooth sensitivity. • Step 1: (Polish) with an Electrifying Blue Toothpaste instantly whitens teeth after one use by utilizing Bluverite®, a proprietary technology that leaves behind blue micro-particles causing an optical whitening effect on teeth. • Step 2:(Boost) Brisk Rinse, a zesty mint flavored mouthwash containing a combination of Bluverite® and peroxide provides fresh, clean breath along with both instant and long-lasting whitening. • Touch Up: (Revamp): A travel-size tube of Whitening Serum is conveniently applied onto teeth as a finishing stain dissolver and can be used separately for whitening touch ups.